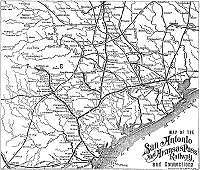 San Antonio & Aransas Pass Railway Co.
San Antonio & Gulf Shore Railway Co.
San Antonio, Uvalde & Gulf R. R.
The San Antonio & Aransas Pass Railway Co. (SAP) was neither the first attempt nor the last to connect San Antonio with the Gulf of Mexico. The first attempt was the San Antonio & Mexican Gulf Railroad, which was chartered in 1850 to construct a line between San Antonio and Port Lavaca on Matagorda Bay, a distance of 144 miles. Six years later work began at the southern end. By 1861 twenty-seven miles of track were in operation between Port Lavaca and Victoria. It suffered during the war and never fully recovered. New owners bought it and reorganized it as the Gulf, Western Texas and Pacific (GWT&P) in 1871. Two years later an additional twenty-nine miles were opened between Victoria and Cuero, which remained the end of the line for more than thirty years. In 1877 the Galveston, Harrisburg & San Antonio Railway (GH&SA) reached San Antonio from Houston. A few years later, the International-Great Northern arrived in the city from the north on its way to the border with Mexico at Laredo. The Southern Pacific Co.(SP) was building east through New Mexico to El Paso. About this time the SP acquired an interest in the GH&SA, which in 1881 began building east from El Paso and west from San Antonio. The two GH&SA lines met west of Del Rio in early 1883, permitting the SP to connect New Orleans with San Francisco. After financial setbacks in the 1890s, the SAP fell under control of the SP. However, the Texas Railroad Commission required the SAP to maintain separate management. Elsewhere, the San Antonio & Gulf Shore Railway Co. was incorporated in 1893 to build 185 miles east to Velasco (Freeport). The company built a few miles of track, went broke, reorganized as the San Antonio and Gulf Railway, and laid some more track. It ultimately reached Stockdale, only thirty-eight miles from San Antonio and well short of its ambitious goal. In 1905 the GH&SA took over both the San Antonio and Gulf Railway and the Port Lavaca-Cuero GWT&P. A condition for the deal was the completion of a line connecting Stockdale and Cuero, forty-seven miles, which the GH&SA did two years later in 1907. Thus, the line originally contemplated in 1850 from San Antonio to the Gulf was completed a mere half century later. Meanwhile, back at the SAP, a 1904 extension from Alice to the Rio Grande stopped at Falfurrias. Also, in 1911 the SAP and the SP agreed to jointly use SAP tracks between Flatonia and Giddings, 38 miles, to provide a shorter SP route between Dallas and San Antonio. However, the September, 1913 Official Guide shows track still under construction south of Hearne to Giddings, 59 miles, on the SP subsidiary Houston & Texas Central. About the same time, the last railroad to connect San Antonio with the Gulf of Mexico, the San Antonio, Uvalde & Gulf (SAU&G), was in operation between Uvalde, Carrizo Springs and San Antonio. In the years that followed the SAU&G reached Corpus Christi, went broke and ultimately became a part of the Missouri Pacific. In 1925, the GH&SA finally leased the San Antonio & Aransas Pass Railway Co., which then disappeared as a separate entity. In 1926-1927 the GH&SA completed the line from Falfurrias to the Rio Grande at Brownsville that was begun twenty years before by the former SAP. In 1927 the SP consolidated the GH&SA and its other lines east of El Paso into the Texas & New Orleans Railroad Co. (T&NO). The T&NO closed the Gonzales-Luling line in the 1930s. By 1946 the remainder of the former Shiner-Lockhart branch was gone. By 1965 the SP had abandoned the lines between Cameron and Giddings and between Yoakum and Altair. During the next thirty years the SP pulled up most of the remaining SAP right-of-way. Today only Cuero-Giddings (86 miles) and other scattered segments remain in use by the Union Pacific Railroad, successor to the SP. Everything else is gone. Codney, Carl. Carl Codney's Texas Home Page is a valuable resource for information on south Texas railroading, including the past and present San Antonio & Aransas Pass Railway. Drury, George H. The Historical Guide to North American Railroads. Milwaukee: Kalmbach, 1985. 376 pages. Histories, figures and features of railroads abandoned or merged since 1930. McLennan, A. D. "Victoria Division's Steam Era." SP Trainline, Fall 2000 (Issue No. 65), Winter 2001 (Issue No. 66). Pasadena, California: Southern Pacific Historical & Technical Society. This is a study of the T&NO's Victoria Division, which included much of the former SAP. McMillan, Joe. "Summers in Yorktown, Texas." SP Trainline, Summer 2002 (Issue No. 72). Pasadena, California: Southern Pacific Historical & Technical Society. A memoir of growing up in the 1950s in a small town on the line between Kenedy and Yoakum, including images of the SAP station and of two SAP cabooses still in SP service. Pliny Fisk Clippings. Beginning in 1915 Mr. Pliny Fisk donated to Princeton University, Princeton, New Jersey, the railroad library of the New York City bond firm of Harvey Fisk & Sons. The collection included railroad books and newspaper clippings on many steam and electric railroads with an emphasis on financial reports and bond issues. In the 1990s Princeton distributed the Pliny Fisk material to various transportation libraries to make the material more accessible to researchers. The California State Railroad Museum Library, Sacramento, California, received a copy of the newspaper clippings, 1890-1924, related to the Aransas Pass. Rand McNally Handy Railroad Atlas of the United States. Chicago: Rand McNally & Co., 1965. Southern Pacific Co. Historical Outline. Pasadena, California: Southern Pacific Historical & Technical Society, 1995. 106 pages, index and bibliography. This is a reprint of the original typewritten document released in March 1933 by the SP Bureau of News. Typical of in-house histories, it is a straight-forward recitation of mostly accurate facts. It gives little attention to outside events, such as competition from other railroads or national events that had an impact on the SP. There are a few typos, such as "Shriner" and "Lockport" on Page 58 and "San Ant. & Arkansas Pass" in the Index. GH&SA founder Peirce is "Pierce." Sterner, Ray. 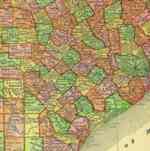 Color Landform Atlas of the United States. Scanned pages from a 1895 Rand McNally atlas, from which a portion of the Texas map, showing the SAP operating area, was copied. The Handbook of Texas Online. Biographies of notable individuals; histories of important events and institutions; histories of regions, counties, cities, and towns; descriptions of physical features.